Well, let's face it, this CRX is too far gone to ever be a show queen for any reasonable amount of money. As you can see from the photos, the paint is already pretty sun burnt, the drivers rear quarter panel has a unique "fade" effect where the two colors of red from previous repairs blend in. Rust is steadily attacking the rear wheel wells (hey, my car gets lighter every day...how 'bout yours!?!) and it still shows a bit of damage on the hatch and rear bumper from a minor hit and run just before I got the car. Now that I have my welder working, I would like to attack the rust at the rear wheel wells and weld on a new bracket to reallign the rear bumper. I suppose while I'm at it, I might as well pull out the dent in the hatch and make that look new, too. I have considered checking the local salvage yards for a replacement hatch with no glass, then getting a piece of lexan to substitute for the glass. That would save some weight, but also cost some $$$ so I will have to see how it works out. So far, the most visible add on's are the twin 60 watt halogen spot lights in the grille. These were born out of necessity because I do a good bit of night traveling on deer infested country roads. These are far superior to the OEM "high beams" and really add a measure of safety. I think they also give the car a bit of a "rally racer" look, but I still woudn't have added them if I didn't feel they were needed for function. You can also see my future ram air scoop cleverly positioned where the passenger park light used to be (right beside the headlight) When I got the car, the lens was broken out by it's mounting screws, but the previous owner had the lens. I tried to make repairs with epoxy but after coming back from one of those "see what it will do" runs, the lens had blown completely out. So, I went ahead and used a roto-tool to cut away some of the remaining plastic. When the new engine goes in, I may go ahead and cut away the metal for true ram air! The only other things that were done was to tint the rear window to keep it from turning into a greenhouse during the summer and keep headlights from SUV's from blinding me at night and add a strip of tint across the top of the windshield again to keep the sun's rays at bay. One day I got tired of the front bumper rattling around, so I decided to pull it off and have a look. My fears were pretty much confirmed as the bolts broke off with just a gentle twist. The old iron oxide cancer (rust) had taken it's toll. For those not familiar, the front bumper is really just a plastic shell with a steel beam running across the front of the car. In the case of the CRX, the steel beam runs roughly across between the front signals on the car. I decided to go ahead and scrap the steel to get rid of some weight and because it was mostly rusted out and useless anyway. The downside is, if I hit anything with the car, I can rest assured that the front end is going to be smashed pretty good. Getting rid of the beam was surprisingly easy. 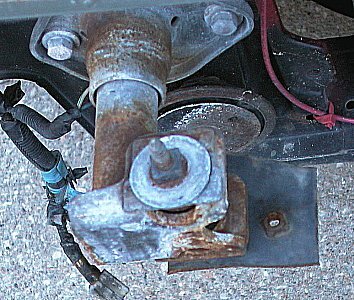 There is one mount on each side of the car where the beam bolts on, and one small "blind" nut welded to the beam where a bolt holds the plastic to the beam. I simply cut a 2 inch square section of the top of the beam which contained the mounting hole where it bolts to the car and the blind nut where the plastic bolts on. Bolt this little plate back to the mount and slide the bumper back on, it bolts right back up, too! While I was at it, I cut out the rear beam, too. It was a little more involved and I had to make some custom mounts. Future plans for the body are pretty minimal...fix the rust and once I get my air compressor, a new coat of paint...probably dark blue...a little less conspicuous. The wheels and tires are covered in that section.